Today I have an interview with Peter Koevari, author of the Legends of Marithia series. Writing a book can be a daunting task. There is a reason why 95% of writers never finish a book, and I believe that it comes down to many reasons. The dedication required to write and complete a novel are immense, and as many authors may tell you… you discover very quickly that your hard work in completing a novel may be overshadowed by the hard work ahead of you to polish, publish, and promote your novel. Nothing worth achieving ever came easy, and if I was to choose a singular “highlight” of difficulty whilst actually writing my books, it would be consistency. Readers care immensely about the fine details, and even with careful planning… it is very easy to get something wrong in the process. Proofreaders and editors should be a requirement of any writer’s process. Do you read reviews written about your book? Absolutely, and I read every one that I can get my hands on. Why? because as writers/authors, we should hold our readers thoughts in the highest regard. After all, it is them that we are writing for. You can never please everyone, but so long as there is merit and truth in any constructive criticism, I will always be all ears. We also do like to know what we do well, and what we should keep doing well for our readers and fans of our books. 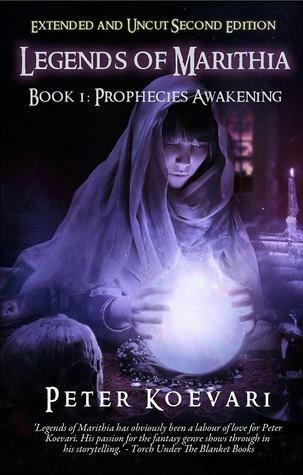 What did I do with my *worst* critic of the first edition of Legends of Marithia: Prophecies Awakening? I invited him to be a proofreader, got more detailed feedback, and spent 6 months sharpening my craft in the areas identified. As a result, Legends of Marithia 2, and Legends of Marithia 1 (Uncut and extended edition) are far better received by readers and are strengthened by it. How do you find people to read and review your book? Interesting question. I have a lot of readers that I know, and many which I only met through social media. Some readers are happy to spend the time to review your book(s), others find the task daunting. I have had some amazing feedback given to me face-to-face, where the reader did not want to key together a review. On the same account, some readers love to write in-depth reviews, but like writing a novel… it can appear daunting. I find people through social media, direct sales, and promotions. I do offer my first book for review to anyone who wants it (eBook), on my website. It was a response to discovering that my eBooks had been pirated, and I wrote quite a long blog about my reaction to that. For the first edition of Legends of Marithia 1, I had minimal input as the process was heavily controlled by my then publisher. Since I regained control of my novels and opted to self-publish, I have full input. Not only that, but I contracted the talents of some amazing artists. Claudia Bartoli-McKinney (phatpuppy art), who happens to be featured in Imagine FX, designed the covers for Legends 1 Uncut, and Legends 2. I have some amazing artwork from other artists as well, which can be found on my website for preview and are also printed in my books for readers to enjoy. Although this really is like asking a parent to choose a child as their favourite… I will put this down to which characters I most enjoyed writing, and readers tend to most enjoy reading. First on the list would be the most popular protagonist, Kassina, people seem to love the idea of a beautiful and dangerous vampire sorceress and she is incredibly fun to write. A close second would be the King and Queen of Dragons, Karve and Nymira, they tend to be quite popular with readers and made for some amazing scenes in my books. But I love them all! Even the darkest of them all, the lord of the underworld, Shindar. The lines between “good and evil” are grey in my books. Peter Koevari is a writer that holds fantasy dearly close to his heart. From an early age, he was immersed in all media of fantasy that he could get his hands on. Memories of movies such as The Dark Crystal, Labyrinth, Star Wars, Conan, The Last Starfighter, The Princess Bride, and many more are cherished memories of fantasy nostalgia. Peter’s hunger for storytelling was growing from a young age. Feeding off movies, video games, and books, the hunger had never been quenched. There was a yearning for something, as if he was enchanted by a spell and did not know how to release it. The worlds held inside his imagination had to be shared with readers of the world. It took over 10 long years to unlock the doors to worlds such as Marithia, and to pen them into books to share with anyone willing to travel to his worlds, but once he found the key and began to write… everything made sense. Peter’s writing will surprise you, may shock you and take your emotions by its talons, but will transport your mind into a world of fantasy like you have never read before. When her sorceress mother and vampire king father are brutally murdered, Kassina makes a pact with Shindar, the Demon of Darkness. In exchange for her soul, Kassina obtains power to become the most feared sorceress in all the lands, and vows to exact her revenge on the people for the deaths of her parents. Granted eternal life, Kassina and her evil are never far away. For many years, the humans and elves of the mystical world of Marithia have lived in an age of peace. But that peace is shattered when King Arman is slain by his own son, a pawn of the vampire sorceress Kassina. Arman’s murder sparks the most brutal and bloody war ever seen between the Forces of Darkness and the peaceful Marithians. In the midst of the conflict, Vartan, a young knight wrongfully outcast from King Arman’s court, reluctantly discovers he is the subject of a prophecy involving the fabled weapon, Talonsphere. In alliance with the legendary dragons, he finds himself with the opportunity to rid the world of Kassina and her dark armies forever, and finally return Marithia to an era of peace.